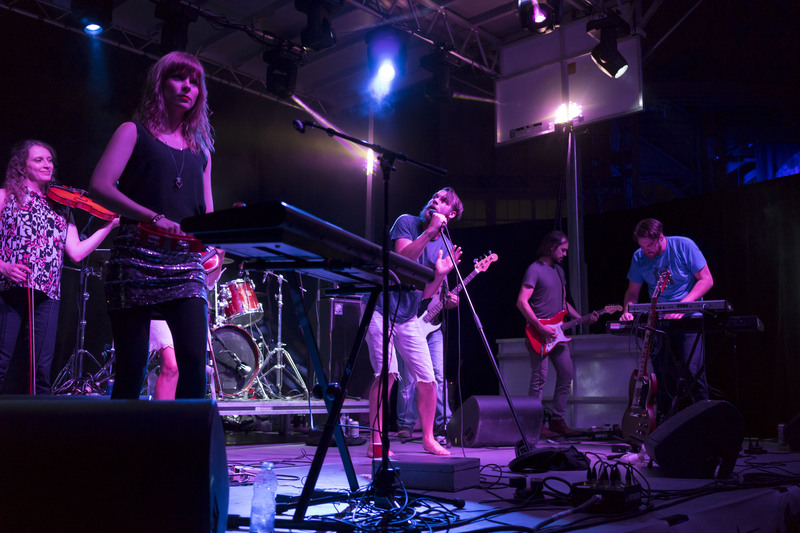 On Friday night, the nine member band, Loon Choir played at Marvest as part of the Cityfolk. Cityfolk is formerly Ottawa Folk Festival as it got renamed and a new location in Lansdowne Park. Loon Choir played to a delightful crowd as it was their album release show on Friday night. The location of the free show was at the Aberdeen Pavilion. Their third full length, All Of This And Everything Else took them 1.5 years to make and you can listen to it over on CBC Music. The local band mixes a variety of instruments from the keyboards to guitars and violins. You would say it’s an epic band. For anyone interested, even though the members don’t appear in the music video as it’s animated, check out their track, Bug on YouTube. Overall, they played a great set to showcase their new album and it was fun to see some people I know at the concert. It’s awesome to see Loon Choir again and perform live. Lastly, before the new season starts, I will be in Toronto for the Polaris Music Prize Gala on Monday, September 21st. Expect some updates on my social media. Get ready for season 11 of the blog. Summer is not finished yet as I had the opportunity to check out the 12th edition of House of Paint. That’s right, it’s 12 years since the venerable outdoor Hip-Hop festival has been dancing and giving beats for so long. From Rap to graffiti art to break dancing just to name a few, it’s a lot to experience the urban culture in the Nation’s Capital. Friday night was the Rock Tha House event. The lineup had Jonathan Emile, Moun Fou, and Buck N Nice as I checked them. DJ 2 Creamz was DJing along with Ducats inbetween the sets. Saturday is the main event and will run all day with the more performances by Kool Krys, Flight Distance and Socalled. On Tuesday night, the National Arts Centre hosted the Polaris Music Prize Panel at the Fourth Stage. The panel was moderated by Polaris founder, Steve Jordan and the panelists this year had Alan Neal of CBC’s All In A Day, Ryan Bresee of Whatever’s Cool With Me, Catherine Pogonat of Radio-Canada and Julie Ledoux of Voir. This year is unique as the panel brought a juror from Montreal and brought some female representation to it. As usual, the panel discussed how the jurors picked their long and shortlist albums. Some had a difficult time putting a particular album on the list and what was considered a strong album to be on it. Another topic brought up was Francophone content being emphasized and recommended. Since Karkwa winning the prize in 2010, there’s been less recommendation for Francophone albums. There was a good turnout for the panel compared to last year.